Many new parents can’t wait to share their favorite water activities with their toddlers. Naturally, all parents worry about safety – and with good reason. The 1 – 4 age group has the highest risk of drowning. That’s why getting the right toddler life vest is so important. With correct safety measures in place, your toddler will have the time of their lives. They’ll have so much fun learning to swim, fish, or getting to go on a boat ride. 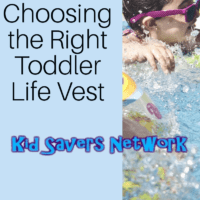 Here are a few things to consider when buying a life vest for your toddler. After that, we’ll take a look at a few of the bests vests on the market. 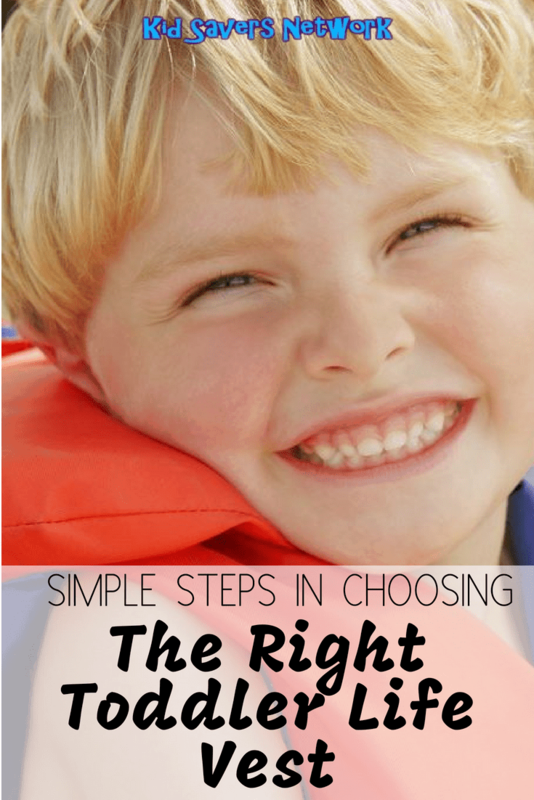 Is Your Child “A Toddler”? For this reason, it’s recommended that toddlers always wear swim vests or life jackets when near the water. More drowning deaths take place in the toddler age range than any other one. This often takes place silently and can happen in as little as 30 to 45 seconds. This should scare parents but not to the point that they avoid allowing their child to go into the water. 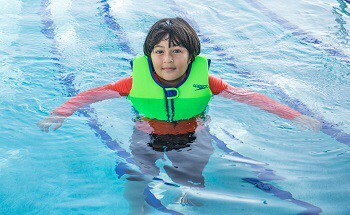 Persistent supervision and a quality swim vest will make all the difference in ensuring that your child is safe. My son is 2/12. He now weighs about 35 lbs. I think of him as a “toddler” and not “pre-school”. However, the life jacket manufacturers say “toddlers” are up to 30lbs! So, you do need to be careful when buying a life vest or jacket. 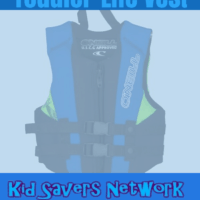 You can find some top-rated life vests at the bottom of this article that will fit 35lb toddlers. If you have a smaller baby, you can check our page here on Infant Life Jackets. When we usually buy toddler clothes, we tend to buy them a little bit bigger to “Grow into”. With life vests, you shouldn’t do that under any circumstances! It’s important that the vest is tight and snug, but not too tight that doing up the zips and buckles is difficult. You shouldn’t be able to life the vest of your toddler’s ears or head. Swim vest designs have come a long way over the years. Ones that are less bulky and fit more like a piece of clothing instead of huge Styrofoam pieces strapped on the outside of a jacket are increasingly becoming the norm. You can also add some reflective tap to increase visibility in an emergency. Some life vests come with plastic whistles. If yours doesn’t, you can easily attach one. Teaching your toddler how to blow it is a lot of fun and very practical. I think all parents prefer buying baby products which conform to the highest safety standards. Unfortunately, there are quite a few personal flotation devices (PFDs) and similar products which are not US Coast Guard Approved. You can usually tell pretty easily as it will be on the label, or in the description if you buy on-line. If you’re interested in having more kids and saving money you may want to choose a color that is gender neutral. That way you don’t end up with a pink life vest that would have worked for your son had it been yellow and blue. You know how fussy toddlers can sometimes be. Mine is a real “boys boy” and won’t go anywhere near pink. A gender neutral color is also good if you keep the toddler vest in your family or decide to sell it after your little one outgrows it. Fortunately, many kids just love bright things, and fluorescent colors show up better in and around the water, too. 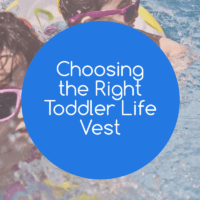 Now that we’ve gone through some things to think about when purchasing a toddler swim vest, let’s look at a few brands and designs worthy of your attention.. 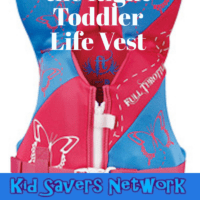 This life vest can accommodate a child who is up to forty pounds. It features the typical leg strap, has easy to use adjustable buckles and is quite comfortable as the name suggests. This model has earned a lot of great reviews due to comfort. Parents report the neoprene material doesn’t get hot and sticky after your child’s been wearing it for a while. You’ll have fewer complaints from your toddler due to the soft design. This jacket is perfect for toddlers who are just over 30lbs. It’s stated to fit children who are 30 to 50lbs. Though parents who have bought this model have said it’s a great fit for kids who weigh 35lbs. It’s a USCG approved type-III personal flotation device (PFD) so you can use it for kayaking and other boating activities. This vest has a great grab strap and covered crotch harness for improved comfort. Another really cool feature is it’s “Rapid Dry”design. This means kids can go back in the water quickly for more fun (say after lunch) and it also makes washing and drying the vest much quicker. O’Neill is a brand you can trust when it comes to water-related activities. So it comes as no surprise that they make one of the top rate life jackets for children. Like the “Full-Throttle” model, this is USCG Type III rated, so perfect for boating, kayaking and swimming. It’s also made of neoprene so it’s very breathable. A lot of toddlers become hot and sticky in the “infant” size of life jackets. Whilst it is important to have a snug fit, having a good material like neoprene makes it more comfortable and something your toddler will actually wear without complaint. It’s not pictured, but there is a behind the neck safety loop too.